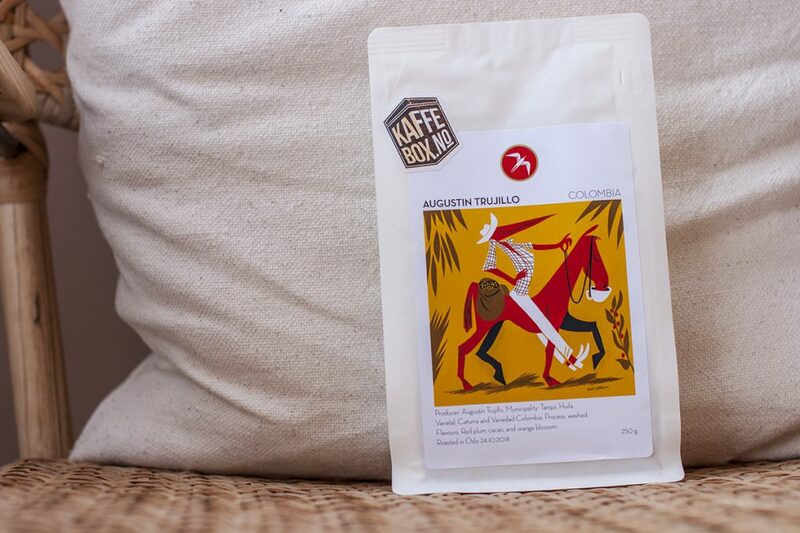 Part 1 for KaffeBox November 18 Box, in this post I’ll only write about the Colombian coffee Augustin Trujillo from the coffee roastery Fuglen Coffee Roasters. In the previous post, you’ve been able to read about the coffee and also what I expect from the coffee. In this part, I’ll share my recipe for an awesome pour-over and Espro travel press as usual. I was looking to find the notes described at the bag “Red plum, cacao & orange blossom”. Drinking this cup of coffee was pure joy, well I’m gonna be honest; I saved a brew for writing this review as well. It’s really good and I enjoyed it a lot. But let’s talk about notes, I’m not gonna lie it has juicy elements, but it’s more than just a plum? Yeah I know, it’s getting a bit weird now but, it’s like hot chocolate without sugar and cream. It’s soft yet powerful. Fuglen Coffee Roasters are from Norway, Oslo, they’re from 2018 and has left me with a great impression. The art on the bag is brilliant, I love it. It’s so cool and pointy. I like it! I would also like to know how good this coffee would be with “fika”. I tried it with a dark chocolate with sea salt. I understand that this can be a weird thing to try out, as almost all coffees are well matched with chocolate. But there are those who really don’t, and that may mean they are only enjoyed on their own. For example: Do you like green tea with dark chocolate I don’t. This was a match in heaven. 1) Pour 60g water for blooming for 40 seconds. 2) 40 seconds in, begin pouring 90g of water slowly. 3) 2 minutes in, begin your third pour of 150g of water. 4) Stop the dripper at 3 minutes and 30 seconds. My expectations were on point, this was exactly what I hoped for. I don’t think I need to write anymore since the expectation said it all! If you have an Espro and a Pour-Over… What should you choose to brew with? Do you want a more balanced cup, go with the Espro, you also get a great result every time as it’s impossible to make mistakes. I like them both, but in the morning the Espro just delivers so much better. It’s so good together with breakfast as well. Fuglen Coffee Roasters is a new roastery in Oslo from 2018, I feel that this roastery has my kind of coffee. So and I hope that we will see them more in the future. Let’s see what the next review has to offer since this was so good!